As predicted, the big money has started to pour into the battle over Proposition 23, the California ballot measure that would suspend the state’s global warming law. But not from where you’d expect. The six-figure donations filling campaign coffers is not coming from the Texas oil companies and petrochemical giants backing Prop 23 but from a coalition of environmentalists, venture capitalists, green tech companies, and environmental justice activists who are working to defeat the measure. 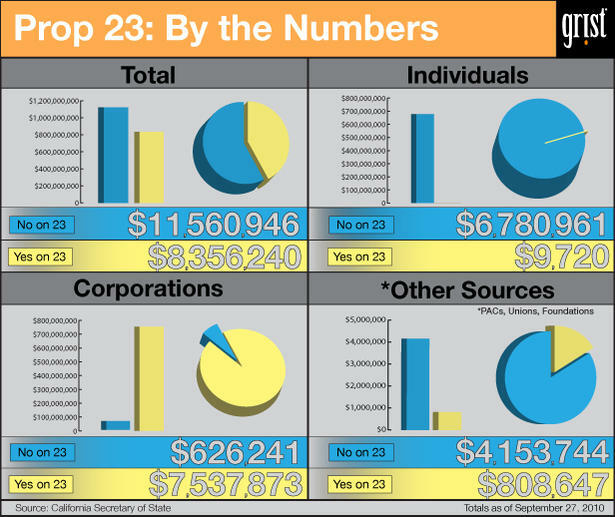 Over the past two weeks, the No on 23 forces have collected more than $1.8 million in contributions while the Yes campaign has taken in only $6,500, according to California Secretary of State records. The windfall for opponents comes as a Field Poll released Sunday shows Prop 23 losing 45 percent to 34 percent with a large number of voters — 21 percent — still undecided. Meanwhile, a poll from the Los Angeles Times/University of Southern California has Prop 23 winning by a slight margin, 40 percent to 38 percent. I’ll take a closer look at those poll numbers later but first let’s see who’s putting up the green to keep California green. Environmental justice groups have jumped into the fight in a significant way this month. SCOPE (Strategic Concepts in Organizing and Policy Education), a Los Angeles-based group that formed in the wake of the 1992 Rodney King riots, has contributed $300,000 in recent weeks. SCOPE is funded by various foundations, including the Ford Foundation and James Irvine Foundation. The organization promotes green jobs and other economic development programs for disadvantaged areas of Los Angeles. Another Los Angeles organization, listed in financial disclosure filings only as A.L.L.E.R.T., donated $150,000 to another No on Prop 23 group called the California Alliance Action Fund: A Committee Sponsored by Social Justice Organizations. Then there’s Californians for Clean Energy and Jobs, a Sacramento-based organization that says its “sponsored by environmental organizations and business.” It gave $100,000 to a No on Prop 23 campaign committee that’s backed by the Ella Baker Center for Human Rights, the Oakland, Calif., organization founded by Van Jones. Meanwhile, individuals continue to write checks. San Francisco investor Robert Fisher, former chair of The Gap clothing empire, contributed another half million dollars on Thursday, bringing his total donations to $1 million. Steve Westly, the former eBay executive and California state controller who now runs an investment group, donated $10,000; Southern California businessperson, Claire Perry, made her second $250,000 contribution. A couple of well-heeled New Yorkers also got into the act: Daniel Tishman of Tishman Construction and Garrett Moran of private equity giant The Blackstone group, each donated $25,000 on Friday. The solar industry, whose prosperity in the United States has been driven in large part by California mandates and incentives for renewable energy, has begun to step up to the plate. Recurrent Energy, which last week agreed to be acquired by the Japanese conglomerate Sharp, donated $50,000, as did First Solar, the Tempe, Ariz., thin-film solar giant whose early investors include the Walton family. Thomas Werner, chief executive of Silicon Valley’s SunPower, one of the largest American solar panel makers and developers, gave $25,000 on Sept. 18. Another Silicon Valley solar startup, Solaria, put in $5,000. The Field Poll released this weekend indicates that the broad-based alliance against Prop 23 appears to be keeping proponents of the ballot measure from gaining ground. The only demographic groups that favor Prop 23 are Republicans (47 percent to 33 percent), Latino voters (41 percent to 38 percent), and less educated voters (37 percent to 34 percent for those with a high school education or less; 39 percent to 37 percent for those with some college education). Geographically, all areas of California, including the conservative Central Valley, oppose Prop 23 by varying margins, according to the poll. Over the past few weeks, the editorial boards of California’s major newspapers have come out against Prop 23. And Meg Whitman, the Republican candidate for governor, has said she’ll voted against the measure, though she supports suspending the global warming law for one year. But with just six weeks to go until Election Day, Prop 23 opponents still expect to see a gusher of oil money flowing into the Yes campaign from fossil fuel interests. California regulators are taking an eBay approach to ramping-up renewable energy in the Golden State. In what might be a world first, the California Public Utilities Commission on Thursday proposed letting developers bid on contracts to install green energy projects. A solar company that offers to sell electricity to one of California’s three big utilities at a rate lower than its competitors would win a particular power purchase agreement. This “reverse auction market” feed-in tariff is designed to avoid the pitfalls the have plagued efforts in Europe to encourage development of renewable energy by paying artificially high rates for electricity produced by solar power plants or rooftop photovoltaic projects.